This festive sheet pan dinner makes taco night a breeze to prepare. Roasting the pineapple first ensures a beautiful char and that shrimp are perfectly cooked. Note: The cooking time for the pineapple will depend on its natural sugar. If using store-bought, cut pineapple, it may take a little longer. Add a pinch of sugar to speed up the process if desired. Preheat oven to 450F degrees. Toss together pineapple, red pepper, red onion, 2 tablespoons of oil, lime zest, cumin and ½ teaspoon of salt in a large bowl. Transfer to parchment paper-lined baking sheet. Bake until tender and charred in spots, about 15 to 20 minutes. Meanwhile, in same bowl, toss together shrimp, chipotle, remaining oil, honey, remaining salt and pepper. Scatter the shrimp over the roasted pineapple mixture, return the sheet pan to over and roast until the shrimp start to curl, turn pink and are cooked through, about 4 to 5 minutes. Remove from oven and sprinkle with cilantro. 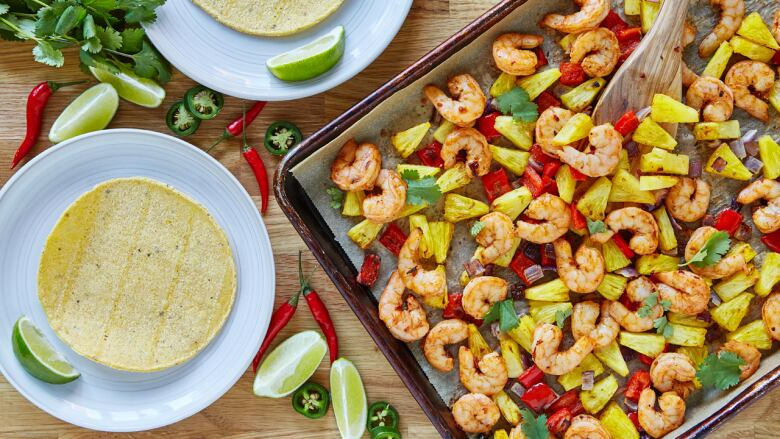 To serve, fill tortillas with the roasted pineapple and shrimp, top with avocado, feta, jalapeno slices and squeeze lime wedges over top.